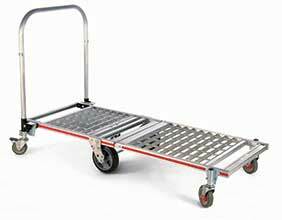 Narrow Aisle Trucks are great for Route Delivery or Warehousing. 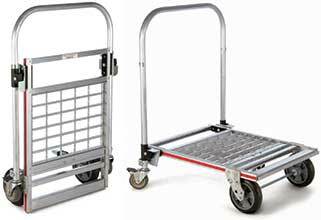 Lightweight aluminum narrow aisle truck dolly helps reduce trips from delivery vehicle to store as you can deliver more material in fewer trips. Aluminum extrusion construction is engineered for extreme use and corrosion resistance. Ergonomically designed oval-shaped handles feature a grooved surface for positive grip and operator comfort. Bottom cross-brace of the removable handles rest on the deck surface to help retain the cargo during transport. Commercial Use Truck features a torsion box deck construction that resists bending and twisting. Truck can be easily stored in a van, ready for use; no waiting for in-store equipment. Non-marking 6" center rigid and 5" swivel thermoplastic rubber casters allow the truck to turn 360° on its own radius to easily maneuver around tight spaces. Capacity is 1200 lbs. 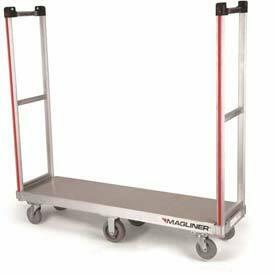 Magliner Six-Wheel Platform Truck has 750 lb capacity for each section. Casters with brakes are standard on the main section and comes with a 39" handle.